In last week’s blog post, we talked about DeMille and his Lost City left behind in the dunes of Guadalupe. This week, we are going to answering the jackpot question: Where are we now? We last left off with the restoration of these awesome artifacts. But how do we do it? We can’t display incredible pieces of Guadalupe history without a couple of – pardon my French – badass art restorers! Meet Amy Higgins and Christine Muratore; the two amazing women whose magic hands perform miracles on art pieces in need of some help. 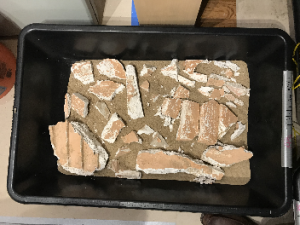 These lovely ladies have been with the Dunes Center since day one (of excavation that is) to bring DeMille’s 1923 plaster back to the museum quality pieces you see at the Dunes Center today. Step 1: Drying. And lots of it! 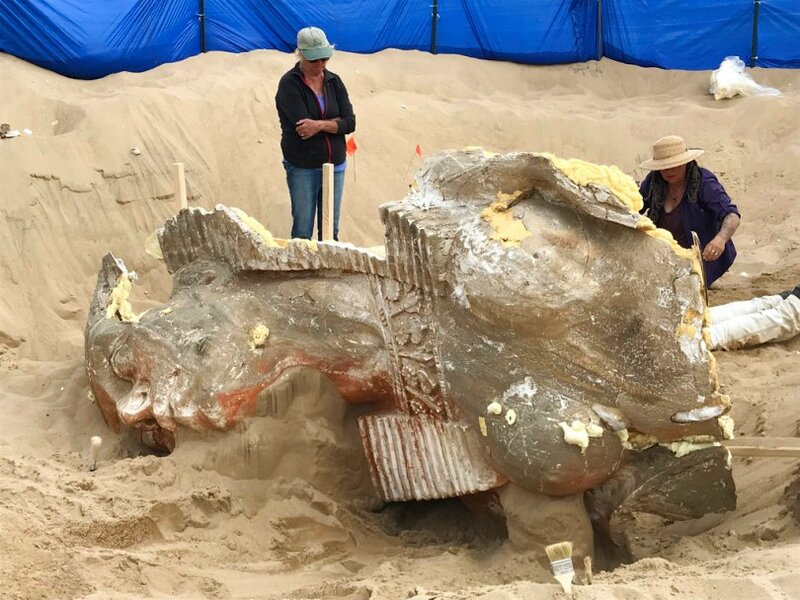 Needless to say, plaster of Paris sphinx heads that have been buried in the sand dunes for nearly a century have experienced their fair share of weather, and need to sit untouched for a few months to completely dry out. Even though the sand it optimal for draining excess liquid, some of the rainwater that reaches the artifacts gets absorbed by the plaster. That makes for some heavy sphinx heads – 300 lb heads to be exact. Those pieces make up one massive jigsaw puzzle that needs some expert attention. To see how those pieces are coming together, check out this news story from KSBY. Once we have our sphinx put back together, it’s time to call in the design team to work on the exhibit. The artifacts speak for themselves and it’s our job to make sure their story captivates our audience (you all!). 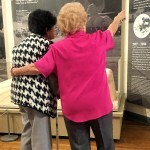 What’s the best way to showcase all the love, sweat, and tears that went into this new exhibit? Have a fabulous party of course! This year our unveiling party doubles as our annual fundraiser gala this July 21. Mark your calendars and stay tuned for ticket information – it’s going to be a memorable one. Educate! 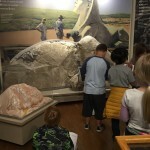 That’s the reason we do all this in the first place, to show people unique pieces of art that is an unbelievable part of our dunes complex’s story. 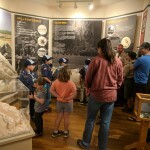 Now students on field trips and in afterschool programs learn about their local history and the science of archaeology that made this all possible. This project has connected thousands of visitors, adults and students alike, with our town of Guadalupe and the dunes in our backyard. To all our visitors, donors, and members who help make these projects happen. What is your favorite part of the dunes story? Share your ideas below!